Cejudo and Dillashaw faced each other in a huge main event! UFC Fight Night 143: Cejudo vs Dillashaw saw UFC Bantamweight Champion TJ Dillashaw go down to Flyweight to face Henry Cejudo for the UFC Flyweight Championship. Dillashaw was trying to become a double Champion, and the fourth person in the history of the UFC to hold two belts of two separate weight classes simultaneously. If he won, he would be joining the ranks of some of the best fighters in the world, with Conor McGregor, Daniel Cormier, and Amanda Nunes being the other fighters to have shared that honour. Dillashaw faced off against Cejudo after having cut his weight drastically, losing a huge amount of his weight in only a few days. While many people had doubted Dillashaw's ability to lose so much weight in such a short amount of time, that's exactly what he did. He came in at an even lighter weight than was necessary proving what he could do when he put his mind to it. Henry Cejudo and TJ Dillashaw squared off in the main event of the night, and it looked like there might be any way in which Dillashaw could lose, given the confidence with which he was coming into the fight. As has been said by Mike Tyson, "Everyone has a plan until they get punched in the mouth." 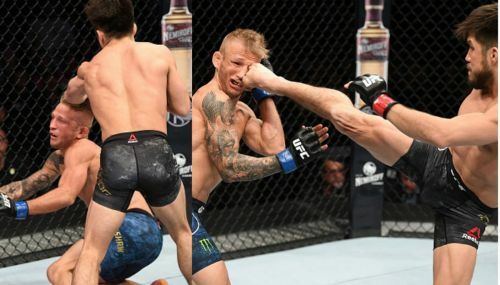 That's exactly what happened to Dillashaw, as within seconds of starting the fight, he had been punched in the face by Cejudo, who followed it up with a kick and even more shots to the head as Dillashaw stumbled around the Octagon. In a matter of moments, Dillashaw had been dropped a total of four times as he was not able to keep his feet. The referee called a halt to the fight, and that was it, as the night came to an end. Henry Cejudo won, despite TJ Dillashaw protesting the stoppage of the fight by the referee. It was over, and so were Dillashaw's hopes of becoming Double Champion. Twitter reacted to the fight as everyone was struck by the unbelievable end to the fight. Cejudo wins via TKO in a minute. Holy. He did it. Beautiful victory for Cejudo who’s an amazing athlete that I have the pleasure to be friends with. And also I can not wait to see these two great champions fighting again at this time in the 135 division.